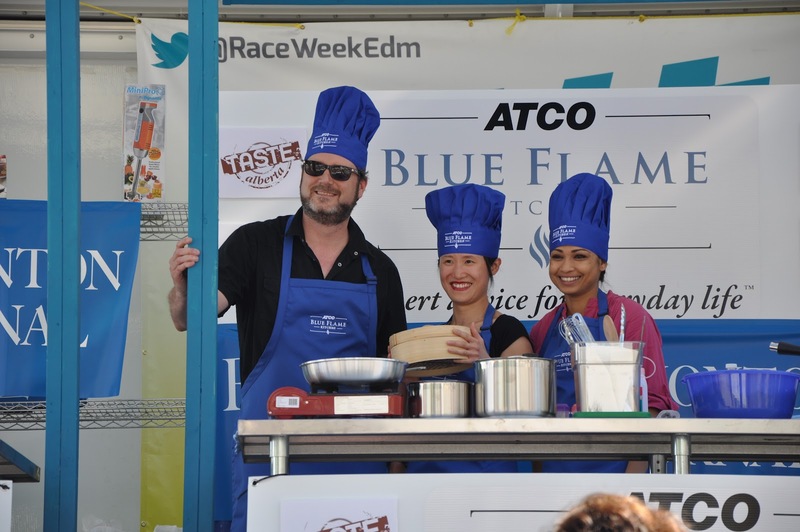 This year, Events Edmonton decided to spice things up by tapping into the growing food community on social media by hosting a cook off between food tweeters and bloggers at the Taste of Edmonton, in conjunction with the ATCO Blue Flame Kitchen. 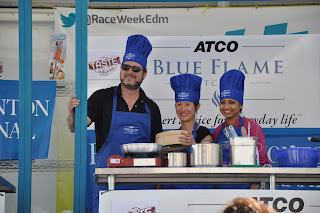 The theme for this cook off was the best food truck entree using Albertan products supplied by Safeway. On the line for the winner was first and foremost, bragging rights of being the winner of the inaugural ATCO Gas Cook-Off! 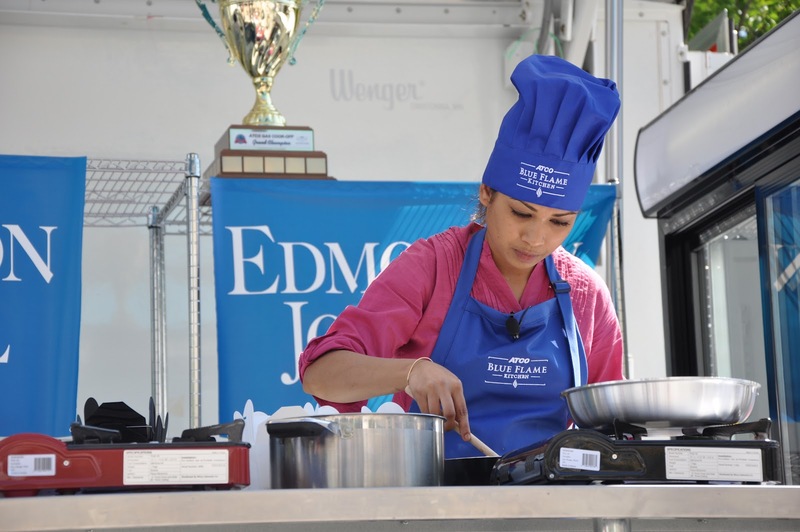 As well as having their name immortalized on a sparkling new trophy, an immersion blender supplied by Amalgamated Food Equipment, Sales & Services, a "YEG to the World" T-Shirt produced by Flavor Clothing, and this year's ATCO Blue Flame Cookbook. 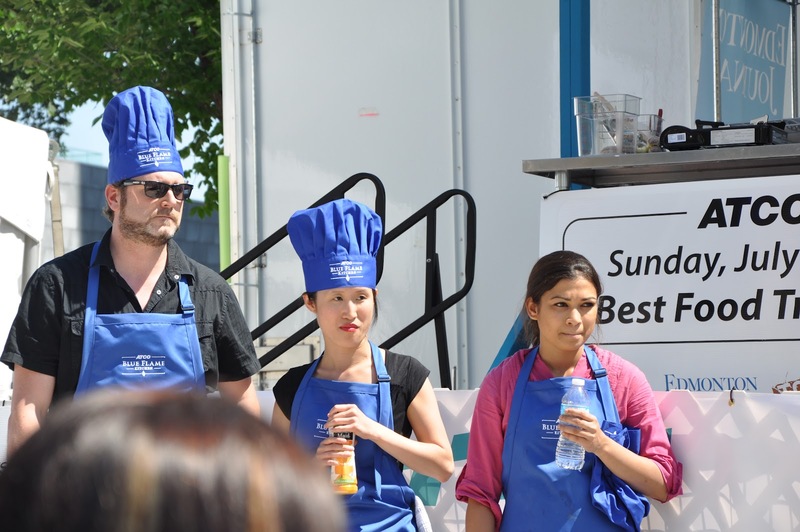 The contestants for this cook off consisted of 3 avid tweeters in the Edmonton food community, 2 of whom also write food blogs. They had a bit of time to prep, then 1 hour to cook and plate their food for the judges. With limited equipment, time, and cooking in plus 20C temperatures, the heat was on! 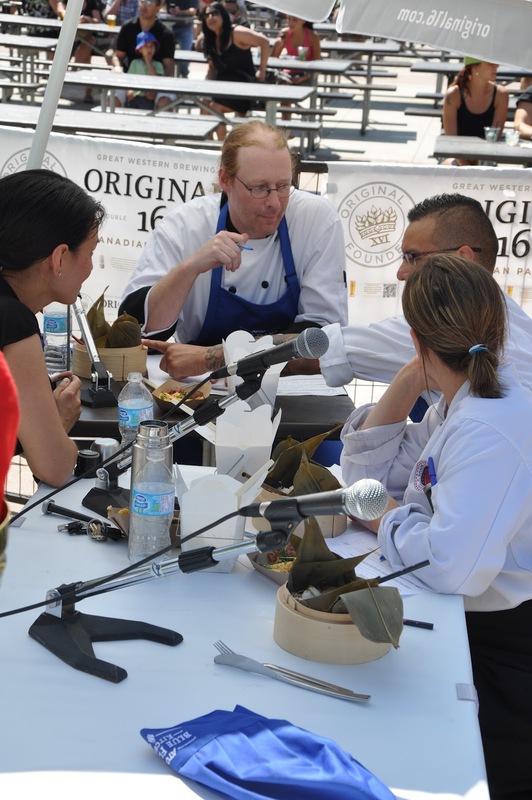 The lovely hosts, Amanda Babichuk and Liane Faulder, peppered the contestants with questions periodically throughout the hour in order to learn more about them, their dishes, and their strategy for this competition. Contestent Phil Wilson, a gas fitter by trade, joked that he was roped into the competition by friends due to his love of food, eating, and in particular food trucks. He admitted that his strategy involved staying up late the night before the competition tweaking his recipe and prepping as much as he could in advance so he wouldn't have to do a lot today in case of inclement weather, equipment malfunction, or some other unforeseeable obstacle. Taking inspiration from his favorite ingredient and classic comfort food - bacon, he created a twist on meat loaf and mashed potatoes, resulting in a bacon wrapped ground feeb sausage with sweet potato mash. Teresa Lin, originally from BC, is a nutritional food sciences student at the University of Alberta by day, as well as the organizer of Dishcrawl Edmonton. Dishcrawl consists of guided food tours through several restaurants in 1 night, allowing diners to explore a variety of restaurants in a neighbourhood that they might not have been aware of before. 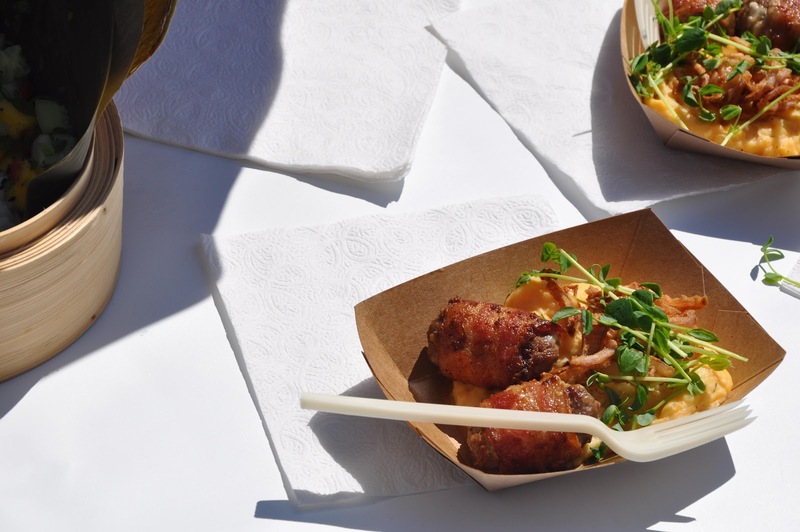 Taking inspiration from her own culture, as well as food trucks that she enjoys such as Filistix and Molly's Eats. Her creation was a feisty chicken bowl with rice and mango salad. Michelle Peters Jones originally hails from India and moved to the UK to pursue a graduate degree. She moved to Canada with her husband, and began to pursue her cooking passion by blogging at The Tiffin Box, as well as assisting Kathryn Joel in teaching classes at the cooking school, Get Cooking. When deciding what she would cook, she listened to her mother's words of wisdom, "When in doubt, hit them with the spice", and secondly, "Keep it simple stupid". This lead her to make one of her favorite dishes, chicken biryani topped with a fried egg. Once the cooking was over with, it was time for the deliberation. First up was Michelle's Chicken Birayani, which Chef Omar said smelled fantastic and felt like it would be good value for your money if it was bought from a food truck. 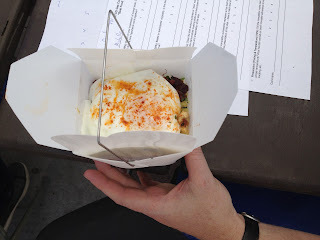 Chef Chartrand said it had the right amount of spice, was very flavorful, and was something that he would eat every day. Chef Porter finished the comments up indicating that there was a sweetness that cut the spice a bit and added a nice touch to a rich dish. Next to present was Phil with his bacon wrapped ground feeb sausage with sweet potato mash. Chef Omar could only sum it up with the worlds "bacon beautiful". Chef Chartrand enjoyed the interplay of textures between the crispy deep fried onions atop the soft sweet potato mash, and said he could eat this dish all day as well. Chef Porter thought the potatoes tasted great and were beautifully seasoned. Last to present was Teresa with her feisty chicken bowl with rice and mango salad. 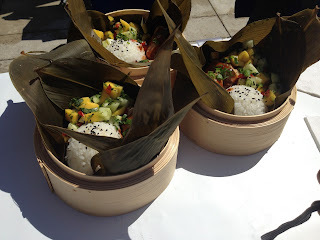 Chef Porter thought it was the most refreshing dish they had tried, while Chef Chartrand noted that the dish looked timeless and was truly a summery dish with it's colors and it's mix of heat and refreshing tastes. Lastly Chef Omar noted that it was perfectly and delicately balanced between sweetness and spice. After what felt like a lifetime for the contestants and those watching in the audience, the judges indicated they had come to a decision. The scoring had been close with a tie between the second place dishes at 62 points, and the winning dish edging forward by only 1 point. As an added bonus, they announced that each of these dishes would be featured in each of the judges restaurants. Congratulations to Phil for winning and for everyone for a spectacular showing! If you would like to try your hand at these dishes yourself, keep an eye out for Wednesday's edition of the Edmonton Journal where these recipes will be published. Overall, it was a fun way to spend an afternoon and I look forward to seeing next year's contestants raise the stakes! 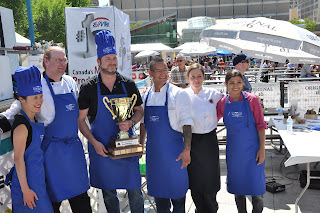 Catch CTV's video footage of the Cook Off! Recipes in the Edmonton Journal! it was a great event, on a perfect sunny summer day. 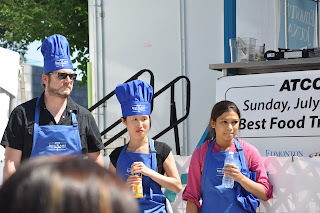 the stage was beautiful, and phil, teresa and michelle all looked so great in their aprons and chef hats! it was really fun to be in the audience, and it certainly was my pleasure to support all 3 of the contestants - they all did a fantastic job! Next year I'd love to see some better mirrors above contestants so we can get a clear look at what they're cooking! Or maybe even a camera crew doing a live feed to a big screen tv off to one side so we can see all the close up action! But it was a great event regardless! Happy to be a guinea pig anytime for you! What a fun day! I loved that there was still a real friendly spirit of competition, even though I'm sure we all wanted badly to win. Nice job Teresa and Michelle!